The finished costume of Hiro riding Baymax. This homemade costume for boys entered our 2015 Halloween Costume Contest, and won 1st place in the Most Creative Costume nomination! My son, Reese, loves dressing up for Halloween and loves to come up with challenging ideas to incorporate his wheelchair into the costume. 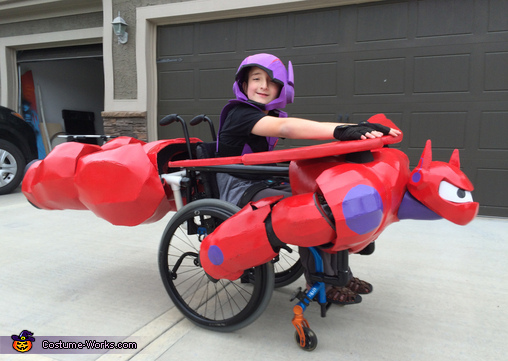 This year, he decided to tackle turning his wheelchair into Baymax (from the Disney movie, “Big Hero 6”) so that he could be dressed as Hiro riding on Baymax’s back. First, we built a custom framework out of PVC pipe and wood that would support the weight of the costume in front of his wheelchair and then another frame for the back of his wheelchair. Then we calculated the size we would need to build the costume to fit around his wheelchair, but still small enough to fit through a doorway. We started by using foam floor mats and began working on a pattern to cut out each of the pieces and build the costume. We knew we wanted the wings to be jointed so they could fold out like Baymax was flying and then swing in to fit through doors. The wings were built out of pink foam insulation boards, carved and painted. The head, body, arms and legs were all built out the foam floor mats in individual sections. Each section was painted multiple times with plasti-dip to seal it, and then painted multiple times with spray paint to give it a nice gloss finish. Finally, we added tap lights to the feet of Baymax so it looked like jets firing from the back. For Hiro’s costume, it was built with colored foam in the same fashion as Baymax. We then used Velcro straps to attach to Reese’s body. The response has been amazing! I’ve never had so many people want to take pictures of him in his costume before. People would call other people to the door of their house to see his costume. When we went to a local Trunk or Treating event, he won first place in the costume contest. When he took it to school and “flew” through the gym during the parade for all the parents, he was the only costume that received a round of applause as he went by. It really made Reese beam with joy seeing everyone love the costume. He’s already working on next year’s costume ideas too. I guess I better get to work if I need to top Hiro & Baymax.